The B&W C5 - worth £150? Bowers & Wilkins has been busy in its workshop coming up its first stab at in-ear headphones, the noise-isolating C5. Discerning Apple product users step this way; it's time to eschew those cheap, white-wired ear buds that come with the iPhone, iPod and iPad in favour of Bowers & Wilkins' in-ear headphones which have been "designed specifically" for Apple devices. Of course, you can enjoy the noise-isolation, hi-grade aluminium materials and cushion-looped headset with non-Apple products too, it's just that Apple users are (supposedly) more likely to pony up the premium-level cash - £149.95, to be precise. For £150, you'd be wise to expect a superior playback performance from the C5s; they come with a bespoke micro-porous filter which diffuses the music and limits noise bleed, supposedly leaving you with a richly deep, wide sound even when you're only listening to Adam and Joe tell fart jokes. 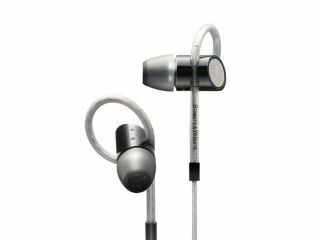 One thing's for sure, Bowers & Wilkins' first in-ear headphone efforts look the part, with a funny little loop design that fixes quickly and comfortably (thanks to infinite adjustability) into the inner ridge of your ear. There's also an inline remote and microphone so you can make and take calls with the set up too. If we were you, we wouldn't go shelling out such a hefty wedge of cash for the C5s until we've had a chance to run them through the old TechRadar headphoneometre to be sure the quality matches the high price tag. Whether you can wait or not, the Bowers & Wilkins C5 headphones UK release date is set for August 2011.